Mountain View Grand is Grand! Snow is gently falling, the calendar turns to the month of Love, and Cupid is sharpening his magical spears of seduction. The perennial pressure is on to treat your special someone to a memorable Valentine tryst. Blame it on Saint Valentine or Hallmark; February is the traditional time to traipse off with your honey to a new and exciting spot in ski country. If you are looking for a winter wonderland to impress your loved one, (something above and beyond the basic ski weekend, rented condo and crowded trails), here is a spot that hits the mark. My husband and I found our romantic resort this season amidst the sparkling snowcapped peaks of New Hampshire. 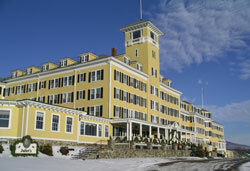 The newest old hotel in the Whites was the setting for our snow rendezvous. Once we found the place in remote Whitefield, the Mountain View Grand lived up to its name, perched high on a hillside surrounded by the impressive Presidential Range. The golden colored hotel stretches across the hilltop, with sweeping mountain views in every direction. Inside the high-class hotel, we were welcomed with a crackling fireplace and the tinkling of a grand piano in the intimate lobby. This 1865 original hotel was completely restored and re-opened in 2002, thanks to $20 million in renovations and historic preservation. The previously posh building had fallen into disrepair over the past two decades. The Mountain View Grand has returned with all the style and service of a forgotten era, currently the only four-diamond property in The Whites. Being skiers first and foremost (that’s what made us fall in love in the first place), we opted to venture off for a few turns at nearby Cannon and Bretton Woods, both within 20 minutes. We have always found skiing to be romantic – braving the elements, cozying up on the lift rides, engaging the endorphins, and anticipating the après ski. On this trip, the extra indulgences at the Mountain View Grand made us eager to wrap up our vertical at half day, so we could return to the regal resort and take part in a plethora of on property activities. We were giddy as two teens, bouncing on our snow tube down the majestic front grounds of the hotel. The resort’s skating rink is a Rockwell like setting, for couples looking to take their love for a spin on the ice. If Nordic makes your lover’s knees weak, you can slip off together on cross-country skis or snowshoes, to explore the resort’s 400 acres of glorious snowfields and forests. The Mountain View has onsite stables offering authentic sleigh rides. 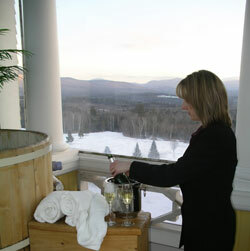 Or you can trot side by side on horseback over snow-covered trails through the sparkling wintry woods. While this saddle-up scenario sounded ruggedly romantic to me, I had to decline for allergies’ sake (runny nose and red eyes are not romantic). Mountain View Grand’s activities are not exclusively scenic and serene. 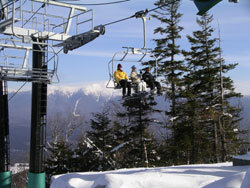 Adrenaline junkies can rent snowmobiles or four wheelers to tour the untamed backwoods for heart pounding thrills. The resort even has a Hummer test track – if you happen to possess an all-terrain assault vehicle that you and your sweetie want to take to task. You’d be surprised how romantic a pulse-racing ride in the woods can be. Any of these outdoor activities will put a little zing in your winter fling. I must mention that these adventures are all add-on expenses to your getaway, but can you put a price tag on love? By mid-afternoon, you should give the outdoor toys a rest and head up to the Hotel’s Tower Tub. The pinnacle of the Mountain View’s top floor full-service spa is a private hot tub in the cupola, two full stories above everything else with an amazing 360-degree panorama. A bottle of bubbly completes this memorable lifetime experience. I recommend you time this not-to-be-missed specialty for sunset. Sit and soak in the views, revisit the highlights of your outdoor playdate, and rekindle your relationship. The Hotel’s extensive renovations included the addition of an indoor pool and hot tub, a modern exercise room, and the revitalization of the elegant parlor for playing Chess or reading a juicy Harlequin novel by the fire. The historic hotel illuminates in the evening. On our first night, we had casual fare in Nicky Finn’s lounge with a rousing game of billiards. Saturday, we dined in elegant Juliet’s over a fine four-course meal. (Unlike similar hotels in New England, jackets are not required here). At night, the hotel brims with music in the luxurious lobby, animated conversation along the mahogany bar, comedy in the Nightclub, and dancing to live bands in the grand ballroom. The celebrated hotel’s ghosts provide entertainment occasionally, but our own spirits were too lively to evoke any ethereal visitors. If your marriage needs repair, if your ski partnership has dull edges, or if you just want to show your loved one you care with more than a mushy greeting card – a snow filled weekend in the Whites may be just the winter hat trick.